To fit any MX5 NC Model. 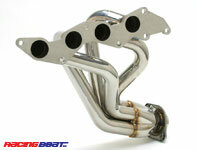 The Racing Beat 4-to-1 configured manifold is sure to offer the MX5 owners many years of performance driving. As used in the MX5 Super Cup Series for the last four years with never an issue. This Manifold was chosen as the best performing and best quality manifold from back to back tests by the MX5 MK 3 Super Cup series. This manifold became the only allowable manifold other than the standard unit in the series and now in the fourth season of racing not one competitor has had an issue of any kind. 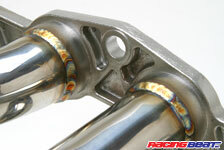 This series has now fully proven this manifold for both durability due to its quality and its performance gain. 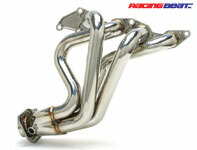 MX5 Racing Beat Race Manifold – Upgrades your exhaust system with a high efficiency exhaust Manifold is a time-proven method to improve the gas flow from your engine. Although modern exhaust manifolds have improved dramatically over the years, and may in fact resemble a traditional header in shape, testing has proven that performance improvements can be obtained with continued refinement of the exhaust manifold design. While the automotive aftermarket might we focusing their efforts solely on performance improvements, the OE manufacturers must combine performance, emissions, sound level limitations, and extended durability factors in their designs. While these parameters are also of concern to the aftermarket, our primary focus directed to maximizing performance. Manufactured entirely from 304-stainless steel to provide both outstanding durability and a stunning appearance, the Racing Beat 4-to-1 configured header is designed to offer the MX-5 owner noticeable performance gains. Our exclusive, cast stainless-steel engine-to-header flange features specially designed exhaust ports that transition smoothly to the primary tubing. Large diameter 1.7" OD tubing has been used for the primary tubing, collecting into a specially configured collector assembly. Exhaust gas exits the header through a genuine Mazda OEM stainless-steel rear flange, mating to the factory connecting pipe section. Emissions:- The secondary catalytic converter incorporated into the mid-pipe section (aft of the manifold section) is retained, this means the car will still pass an emissions MOT test.